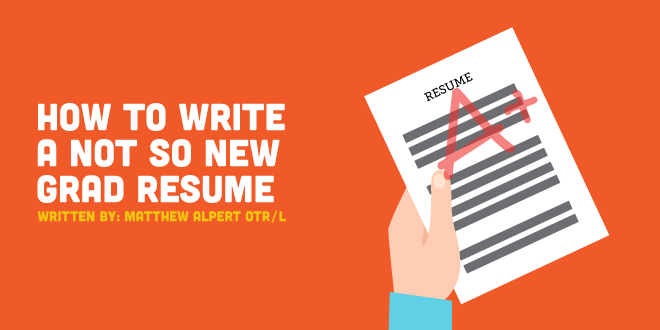 Since graduating and landing your first clinical position, it might be time to bring your resume up-to-date. For those who have been successfully practicing as an occupational therapist, your resume might need updating for the all important promotion, internal interview, or a new position at a different facility. When updating your resume, there are many ways to approach it. The general theory regarding a resume is to detail your work history in an easy to read format. If the formatting of the resume is too complex, then the Human Resources director reading the resume will become overwhelmed with information and move on to the next one. Always remember the U.S. Navy’s K.I.S.S. principle, “ Keep It Simple, Stupid” as a good rule to follow. As a new grad occupational therapist with brief work experience, your resume should only be a single page with 5-6 simple sections. This section is pretty straight forward, and should include your name and title. Below the page break, use some keywords that will be picked up by computer systems that sift through resumes for potential applicants. Some of the more common terms utilized can be found in the AOTA's Practice Framework 3rd Ed, such as professionalism, safety, patience, organization, communication. Most resumes are submitted through an online portal, therefore, it is important to indicate you are an occupational therapist with experience. The language utilized in your summary should be used to reinforce your dedication to maximizing function and improving the quality of life, a core value within the American Occupational Therapy Association's mission statement. In addition, you should highlight yourself as an individual who will be dedicated to the clinic, hospital, or school you are applying to. Furthermore, mentioning that you have experience will bring your summary to attention in comparison to other applicants. There a several ways to index your occupational therapist work history. Traditionally reverse chronological order will put your most current employer to the top of the list. When detailing your position, make sure there are 2-4 bullet points displaying specific duties of the position held. Some newly graduated occupational therapist work at more than one facility. If this is you, do not be redundant with the positions. Take these bullet points to elaborate on your distinct skills you have acquired from each position held. This section is not mandatory, however, can be included to spotlight additional experience acquired during your OT educational journey. When listing your fieldwork experience, keep it to a single line for each placement, location, and a brief description. If you have an extensive work history and do not want to include your fieldwork experience it is completely acceptable. Example: "L.A. County Hospital, Los Angeles, CA. Acute psychiatric rehabilitation for adults "
Your educational career is no longer the focus of the resume. The information that should be included are the schools attended and degrees awarded. Additionally, you can also include any accomplishments you have like a GPA over 3.75, student council, awards won, etc. References are a matter of preference. Typically, when applying for a position you may have already entered your information into a computer system including personal or professional references. Other times, the interviewer might ask you during the interview for your references. In the footer include, “ ~References Available Upon Request~ ”. Frequently, an application will be filled out in addition to applying for an occupational therapy position, which is where your reference will be indicated.